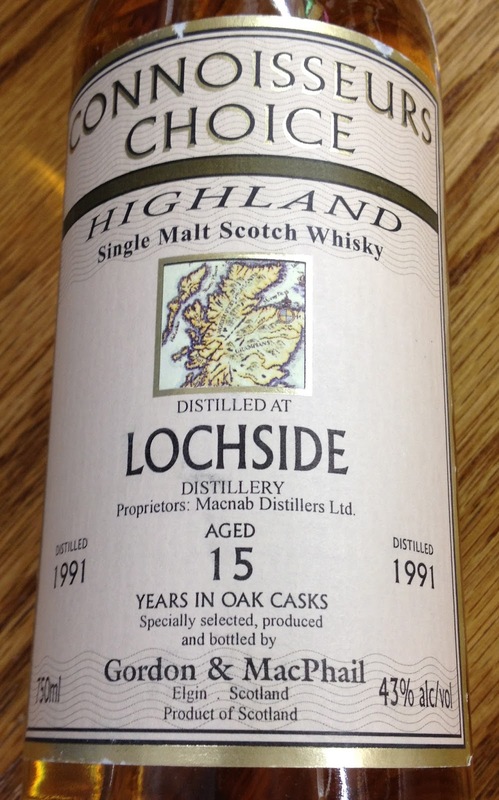 Lochside is a now long-gone distillery that was located on the east coast of Scotland north of Dundee, in the same area as Glencadam and the also defunct North Port/Brechin and Glenesk distilleries. The distillery had a very short and somewhat inglorious life, beginning in 1957 when a former brewery was converted into a grain and malt distillery by MacNab Distilleries. It passed through a couple of different hands, before landing in the lap of Allied Distillers in 1992, who promptly shut it down. The buildings remained for another dozen years, before it burned down in 2004. 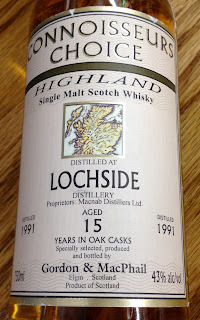 Stocks from this distillery appear to be almost gone, but I was lucky enough to try a dram of Lochside from one of the last years of their production at the Highland Stillhouse. Nose: very rich overall, musty vanilla, warm caramel, vaguely fruity melding with sweet and creamy malt, very light peat, bubblegum, a hint of cinnamon, a little savory. After adding a few drops of water, there was more and sweeter vanilla, perfumed fruitiness, apples, more peat and malt, and something like savory sherry. Taste: flat, noticeable alcohol heat, lightly malty, pepper, sweet with a sour edge up front, fairly tannic, light peat near the back of an industrial/organic quality, bittersweet fruitiness (ripe berries) over everything. After dilution the palate becomes a bit lighter and more balanced, with less fruit (except up front), more creaminess, the tannins come in later, and some sour malt throughout. Finish: tannins, light malt, a hint of fruit and peat. After dilution it becomes very strongly tannic, with a big hit of black pepper, and a somewhat abrasive quality. This is a very odd whisky. The nose got my hopes up, as I found it to be rather enjoyable, but the palate just left me cold. It felt rather disjointed, never quite settling into a comfortable groove. Reduction down to 43% probably doesn't help, but I'm not sure if more oomph is what it really needs. There are a few bottles left in Oregon, which tempt me to dig into it and see if there's more to be found, but I already have so many whiskies that are clamoring for my attention that I'm not inclined to bother. Sure, there's the appeal of drinking something from a Lost Distillery, but this one doesn't exactly excite me. They can't all be winners, though if the Malt Maniacs' scores are to be believed, this is an aberration in an otherwise solid line-up of IB Lochsides. I'll have to keep an eye out for others, to see if the distillery's standard output was better. Teaninich is one of the distilleries in Diageo's mega-stable that rarely sees the light of day, primarily going into their blends. The distillery was founded in 1817 by Hugh Munro, on his estate. It passed through a number of owners and leaseholders during the 19th century, until it landed in the hands of the proto-Diageo DCL in 1933. Since then the distillery has been progressively expanded, usually by adding new buildings alongside earlier ones. The first expansion was from two to four stills, then from four to ten stills, until the whisky crisis of the 1980s led to the whole place being shut down. The newer chunk was revived in the early 1990s, and the original distillery was destroyed, leaving Teaninich with the six newer stills. Most recently Diageo announced an enormous expansion on the site, which will create a new *sixteen* still plant at a cost of £50 million (this exceeds their already vast site at Roseisle, which cost £40 million). What will happen to the older six still plant when the next down cycle of the whisky market occurs is anybody's guess. 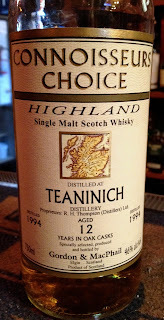 In a sense I've already tried some Teaninich before, as it's a component in Compass Box's Oak Cross blended malt. This made me want to try single malts from the component distilleries, to get a sense of what they contributed to the whole. Luckily the Highland Stillhouse had a bottle on hand. Nose: light sherry, a hint of vegetal/smoky peat, a little musty, floral, raisins, malty vanilla, blackberries. After adding a few drops of water, the nose became a bit lighter and gained a bit more vanilla, but remained largely unchanged. Taste: rich but not overly assertive creamy sherry throughout, sweet and sour with blackberries up front, vanilla comes in mid-palate, bitter chocolate, pepper, and oak near the back. After dilution there is more malty sweetness throughout, with more black pepper, meatier/drier sherry, more creaminess, and a little peat at the back. I really enjoyed this whisky. It's bottled at a quite respectable 46% and there's great balance between sherry and malt, with just a bit of peat for spice. I could definitely see how it fit into the Compass Box Oak Cross blended malt, bringing some creamy sherry to the table. It's a shame that Teaninich isn't bottled as a single malt more often, because it fills a nice niche similar to Bruichladdich. As full bottles of this G&M expression are still available, I'd be really tempted to pick some up if it wasn't over $80 here in Oregon, which just seems silly for such a young single malt. Still, highly recommended if you can find it. Bowmore lays claim to being the oldest operating distillery in Scotland (Littlemill opened sooner, but has been closed since 1994). Located on the island of Islay, Bowmore was created after the laird of Islay, Daniel Campbell the Younger, decided to create a model village on the island in 1770 centered around the church that had been completed the year before. Because of the favorable conditions, David Simpson founded the distillery in town about a decade later in 1779. The distillery became one of the main sources of revenue for the village, which meant that the residents' fortunes waxed and waned with those of the distillery. After passing through a number of different hands over the centuries, Bowmore is now part of the Morrison-Bowmore mini-conglomerate, which also owns the Lowland distillery Auchentoshan and the Highland distillery Glen Garioch, which is all owned by the Japanese drinks company Suntory. One of the Bowmore's more interesting features is that it is one of the few remaining distilleries to have its own traditional floor malting facilities. While insufficient to supply all of the distillery's needs, it does mean that Bowmore's peat has a different character from other Islay distilleries, which mostly source their malt from Port Ellen. Nose: rich smoky peat over caramel, herbal/vegetal notes, woody licorice, a little bacon, coffee, dry malt, a bit ashy, salty/creamy, light sherry and floral notes. After adding a few drops of water, the focus shifts towards the oak and peat, with the sherry and malt retreating, retaining the bacon and caramel while losing the floral notes. Taste: sweet all the way through, pepper and floral/violet notes come in right after the sweetness and stay throughout, muddled fruit and sherry arrive mid-palate, with fresh oak, ashy/vegetal peat, and a bit of bubblegum emerging at the back. After dilution, the palate loses a lot of heft and complexity, especially up front, with mild malt leading into heftier oak, pepper, and peat. I have somewhat mixed feelings about this whisky. It's bottled at a fairly weak 40% with chill filtration, which doesn't endear it to me. Sometimes it really seems to hit the spot, with a nice mixture of gentle peat, floral notes, and sherry. Other times the whisky, especially the palate, just seems too tepid. I feel like some of this could be alleviated with craft presentation - increasing the bottling strength to 46% and skipping the chill filtration. I like the flavors, I just want them to be bolder. This is especially true given that Bowmore 12 generally runs above $50 here in Oregon, which makes me expect more from it - a lot of whiskies in that price range have upped their game. They also have Bowmore Legend, a younger NAS bottling, to hold down their entry level prices, so the 12 Year has room for improvement. The 'gentle Islay' moniker isn't bad, I just don't want it to be so gentle that it falls flat. Nose: very savory sherry, subdued herbal peat, berries, caramel, a little bacon, woody licorice, pencil shavings, smoother than the 12 and much lighter floral notes (though more comes out with time). After adding a few drops of water the malt moves forward while the sherry moves back, while the bacon and fresh wood notes edge out the peat. Taste: less sweet than the 12 but smoother, more sherry - but not very fruity, savory overall, pepper and peat comes in early - keeping it on the bitter side of bittersweet, not very floral, something a bit minty throughout - with time there is more undergirding sweetness. After dilution the palate becomes creamier but flatter, with the peat retreating in favor of malt and sherry, and some raisin notes peeking out. Darkest is both older and more sherry-driven than its younger sibling. Interestingly this doesn't seem to up the sweetness - the sherry is much more in a savory than a sweet mode. The slightly higher bottling proof at 43% is noticeable and gives it a bit more heft, but craft presentation could definitely help here too. The flavors weren't quite distinct enough to really get my pulse racing, though I generally liked what it had to offer. Another case where I think they could have a contender, but it doesn't move me enough. Adding to the case, Bowmore 15 is almost twice as expensive as the 12 around here, which once again leads me to expect more from it. There are plenty of whiskies around now with a peat/sherry theme that would get my money before more of this. Nose: clearly older, heavier oak, sherry and ripe berries underneath bourbon barrel notes, underlying malt, more august peat, dry herbs, integrated floral notes, popcorn, fatty bacon, purple. After adding a few drops of water, the malt gains some ground and becomes toastier, with the oak, bacon, and peat subsiding a bit while the floral notes become more prominent. Taste: sherry, malt, pepper, and oak all hit at once, initially sweet - then bittersweet, purple, mild peat at the back twined with oak tannins, chocolate raisins mid-palate, floral notes seem a bit out of place here, fruity bubblegum. After dilution it becomes sweeter but flatter, with less sherry and pepper but a bit more tannic oak at the back - however the overall structure remains much the same. Bowmore 18 unfortunately reminds me of another 18 year old whisky - Glenfiddich. In both cases I feel like they have picked casks that have extracted a bit too much oak, purely because this is what they think buyers of older, more expensive single malts expect. Without the heavy dose of tannins, the more subdued, oxidized peat could be really lovely. There's definitely more integration of the flavors here, which is a very appealing quality. But the oak just keeps poking at me, disrupting an otherwise pleasant experience. Again, there are other old peated whiskies that I would turn to before this one, both in terms of flavor and price. My generally feeling about Bowmore's core range of whiskies is 'almost'. I think they have some really solid single malt to work with, but the final products just don't quite hit the mark. A little tweaking of the recipes and improved presentation could take them from 'meh' to 'wow' very quickly. This does make me really interested in trying some of Bowmore's cask strength expressions as well as single casks from independent bottlers. I want to like Bowmore, I just need more of it to be present. I was lucky enough to both taste and grab some samples of these whiskies from the PDXWhisky tasting back in April. Since then I've sat down a couple of times to do more detailed reviewing. Balblair was founded in 1790, making it one of the oldest distilleries in Scotland that is still in operation. Located just north of the Speyside region and near Glenmorangie, it languished in obscurity until being revived by investment in the early 2000s. In 2007 it took the rather radical (for the scotch whisky industry) move of shifting all of their bottles to vintages rather than standard age dates, emphasizing how the spirit can change from year to year rather than blending to produce consistent products. 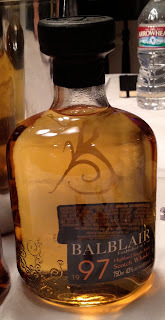 With that said, Balblair has still stuck with fairly standard ages, putting out 10-18 year old bottles in their core range, with additional older vintages that command significantly higher prices. Here I'll look at two different whiskies that are roughly the same age at 10-11 years old, putting them at the younger end of the spectrum. Nose: fresh green malt, oatmeal, slightly sour berries and fruit esters (apples/pears), a hint of vegetal peat, pine, floral, Jolly Ranchers, bubblegum, vanilla, gentle toasty oak, light baking spices, a bit rum-like and savory. After adding a few drops of water, there's more obvious barrel influence with caramel and brown sugar coming out, the floral and malt notes merge, the vanilla becomes almost sharp/piercing while integrating with the fruit esters, and some raisin and soapy notes pop out. Taste: very fresh flavors, malt and floral notes throughout, sweet and sour fruit (apples, berries) and malt up front, becoming bittersweet mid-palate, with fairly hefty oak, pepper, vanilla, grass, and fruit (apples, pears, stone fruit). After dilution, there is caramel and raisin sweetness up front, then bitter herbs (bay leaf?) and oak over malt plus a bit of soap from the mid-palate back, some floral notes linger, and there's light pepper. Finish: coffee beans, malt, berries, stone fruit, gentle oak, floral. After dilution it trends towards bitter herbal/vegetal notes, but has a very creamy floral/malt element alongside light pepper. Bottled in 2007 at 43% as one of the inaugural releases of their vintage line, this malt seems to do best undiluted. While experiencing it with a bit of dilution may be educational or interesting, the trend towards bitter herbaceous notes and oak tannins as well as a lack of punch just rubbed me the wrong way. Neat, it was a wonderful display of malt, floral, and vanilla notes in almost perfect harmony with oak tannins from the first-fill casks, which hit me just right. 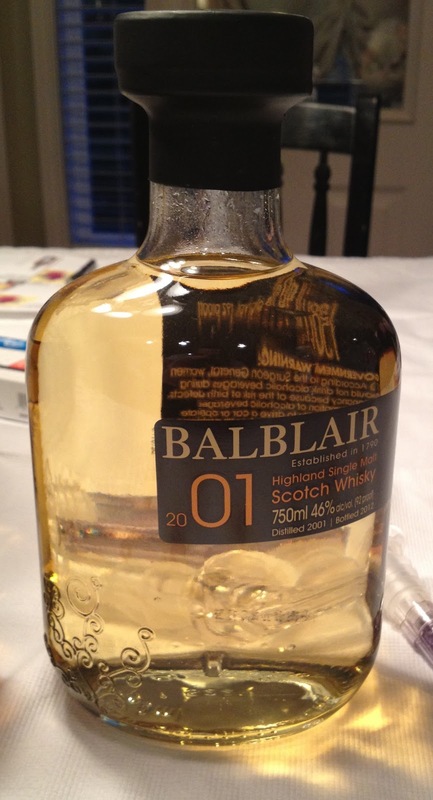 Balblair has recently put out a second release of the 1997 vintage, with several more years under its belt. I'd be very interested to try it, to see how well the malt has held up to the extra time in oak. With the proper balance of spirit and cask, I can imagine it being a stunner. Nose: cake frosting, nutty roasted grain, feint-y, TCP, dark fruity oak, green fruit and vegetal peat, vegetables (celery? ), clean sweet malt and vanilla underneath. After adding a few drops of water, the nose blossoms, with more first-fill bourbon barrels influence and reduced feint-y notes but retaining a somewhat unpleasant vegetal edge, a certain grassiness (rhum agricole-ish), more integration, some cinnamon, fruit, and sherry notes come out alongside hints of something floral. Taste: clean sweet malt, vanilla, and caramel throughout, a touch of sherry, big pepper, herbal/vegetal notes, and a healthy dose of oak tannins mid-palate and back, vanilla, raisins. After dilution it becomes somewhat chewy and buttery (diacetyl), with what seems like stronger sherry influence, trending towards bittersweet, very rich and thick well-polished oak, bigger spice (cinnamon), nut, and fruit notes, plus a bit of coffee. This whisky was bottled in 2012 at 46%, making it the fourth release (I think) in Balblair's entry-level range. This one doesn't really do it for me. While it did improve dramatically with water (maybe 43% is the ideal for young Balblairs? ), the feint-y notes persisted and rather threw off the nose. However, remembering back to the first time I tasted it, it was a lot better after drinking some peated whisky, when the sweeter malt notes seemed more apparent. Maybe burning out the receptors for vegetal/phenolic notes in the nose lets the underlying malt shine? I'm not sure, but I'd give this one a swing and a miss. I can imagine it improving with time, so I'll keep an eye out for future releases of this vintage in another two to three years, when the new make elements may have given way to more heft and balance. Comparing these two whiskies goes to show how hard the master blenders at scotch whisky distilleries have to work to put together consistent releases year after year. Each of these expressions must be a combination of many barrels, yet they still have very distinctive characters. In some ways I feel like this is a nice change of pace, as it edges towards the variety of single barrel expressions without as much of the associated costs. On the flip side, every vintage is going to be different, so there's no guarantee that you will like future vintages. There is a clear familial resemblance between the two, but I wouldn't be surprised if I was the only person who had polarized opinions about these two whiskies. With that said, I'm definitely going to seek out more releases from Balblair. I really enjoy the lighter malt-focused, floral house style and would really enjoy seeing what it becomes with a bit more age.